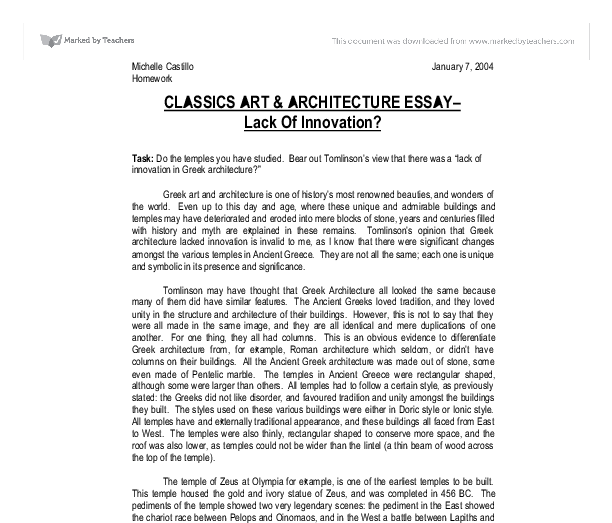 CLASSICS ART & ARCHITECTURE ESSAY- Lack Of Innovation? Task: Do the temples you have studied. Bear out Tomlinson's view that there was a "lack of innovation in Greek architecture?" Greek art and architecture is one of history's most renowned beauties, and wonders of the world. Even up to this day and age, where these unique and admirable buildings and temples may have deteriorated and eroded into mere blocks of stone, years and centuries filled with history and myth are explained in these remains. 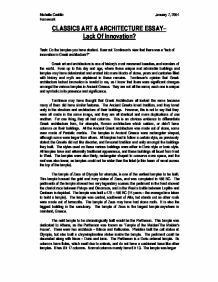 Tomlinson's opinion that Greek architecture lacked innovation is invalid to me, as I know that there were significant changes amongst the various temples in Ancient Greece. They are not all the same; each one is unique and symbolic in its presence and significance. Tomlinson may have thought that Greek Architecture all looked the same because many of them did have similar features. The Ancient Greeks loved tradition, and they loved unity in the structure and architecture of their buildings. However, this is not to say that they were all made in the same image, and they are all identical and mere duplications of one another. ...read more. The next temple to be chronologically built would be the Parthenon. This temple was dedicated to Athena, as the Parthenon was known as 'Temple of the Maiden/The Maiden's House'. There were two architects - Iktinos and Kallicrates. Pheidias built the cult statue at Olympia, but also built a chryselephantine statue inside the temple. The pediment could be decorated along with frieze - Doric and ionic. The Parthenon is a Doric ordered temple. Its columns have flutes, which swell due to entasis, and do not have a cushioned base like other temples. It has 8 x 17 columns. Normal columns merely have 6 x 13. The temple was larger and wider simply because a lot of people went to gather round the altar. The Greeks wanted this to be an outstanding representation of power and wealth. Another example of a different temple would be the Erechtheum, which was built roughly between 421 and 405 BC. The architect of this temple is unknown, however we do know from other surrounding pieces of remains from the nearby location, that the architect must have faced great difficulty in constructing and building this temple. ...read more. As a matter of fact, the Erechtheum being a Doric building in itself is an unusual factor. * There are two main ground levels, but three different roof levels. * The Erechtheum has an underground entrance, thought to be the entrance in order to get to the floor above the ground level. * The south porch sticks out at the west end of the wall, rather than the middle of the wall, with a small flat roof. This allows the porch to be inaccessible unless accessed from the inside, through an opening, thought to be an underground entrance. * The West porch is also a "false porch" with no entrance from outside. This time, it has a basement room beneath it. In conclusion, I strongly disagree with the statement made by Tomlinson regarding Greek architecture and innovation. I believe that Greek temples do not lack innovation, as the above information on three very different and unique temples specify that they are all originally planned and built according to the discretion of the Greeks and the architects. Each of the temples served a different purpose, and these temples were built in the best of the ability of the architect, successfully built to carry out the temple's purpose. Michelle Castillo January 7, 2004 Homework ...read more. looked...ugly, while I was more the All-American-boy type-good build, blue eyes, nice smile...I often thought that God should have given him something decent looking on the outside, instead of putting it all in, hiding it, so that nobody could ever see it as first glance." It was also a concern that the naos would be too cramped because of the entassis of the columns, which means that the columns are broader at the base than at the top. The swelling at the base would take up a lot of room in the naos. and human (earth)" (Stockstad Bookp.72) and because of their similarity in appearance, they are often confused with Egyptian Pyramids. The temples was originally approached by a triple stairway, the core was said mud brick, the exterior of fired brick, and each with an inscription: "Ur-Nammu, king of Ur, who built the temple of Nanna." What factors did an architect have to consider when designing a temple? Is the Parthenon a Typical Doric Temple? The entablature was less than a third of a column height and divided into three parts architrave, and the cornice. In the frieze there was one triglyph over each column and one between so that the intervening metopes were approximately square.